How can one begin to make a tribute page to one of the greatest kings of all time, who has reigned for 70 full years. Especially, sinceHis Majesty has done so much in his lifetime, all for the benefit of the Thai people, in so many work scopes. He was also a talented individual in music, painting, sports, invention, and more. How can one person possess such a widescope of work and talent. It is no wonder that the majority of the Thai population view him as semidivine. It would seem benefiting that he should be viewed in such a way, even though we know in fact that he is a human being, albeit, an extraordinary one. As someone once said, "This man named Bhumibol Adulyadej took over the 'job' from his brother at the age of just 19, and worked tirelessly for 70 years. 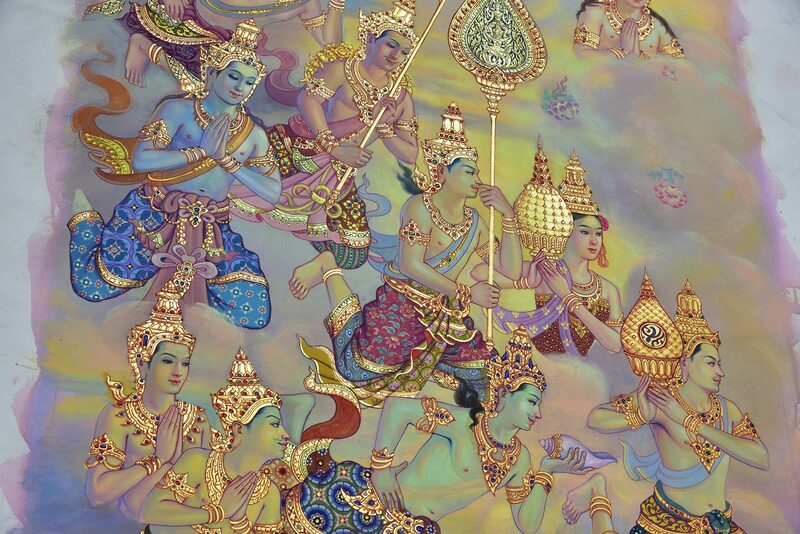 He has travelled to all corners of the kingdom, with more distances attached to him than anyone else in Thailand and the world. He has seen every inch of Thailandhis kingdom, been to places that were not easily accessible, and helped countless of people to have proper jobs, make their own income, and look after their own livelihood as well as their family's". His work spanned to include creating new inventions that would make things easier for the people to apply themselves with, most notably in the argricultural and environmental sectors. The Royal Projects carried the king's many initiatives to bring the bare necessity level of the population up to par with the general acception of the bare minimum. His talent in music, arts and sports were known worldwide. He was simply extraordinary. It is thus not difficult to understand why the majority of the Thai people see him as a super human being, nearest to a devine being if needing comparison. He works tirelessly 24 hours a day, 7 days a week, without complaining. All his works are for the benefits of his people. His work spanned nearly his whole life, to the point where his mind is still alert, but his body had given up. I don't know anyone who does not complain about their job, even though they work from only 9 to 5. King Bhumibol Adulyadej has done more for the betterment of Thailand than anyone else that we know today. He is the father of all examples, and should be remembered by his subjects forever, his teachings and examples to be passed down from generation to generation. 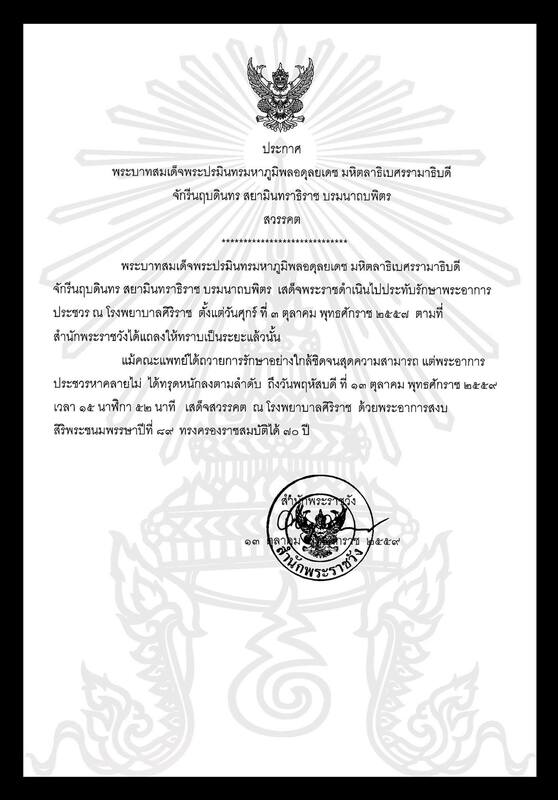 On Thursday 13 October 2016, the Royal Household Bureau announced that His Majesty the King had passed away. The Thai people was told that his condition was unstable since Sunday, and everyone already prepared for the worse. It is still difficult to accept that the time has finally come, even though we know deep in our hearts that the time was near. One story that was repeated was that while people were travelling on the sky train and when one man saw the news of the king's death on his mobile phone, he started to cry. Then another person started crying, and another, and another. They started to comfort one another even though they are all strangers. His Majesty King Bhumibol was the strenght of the land, and he was the force that always united his people. When times were bad, he would appear and make things better. 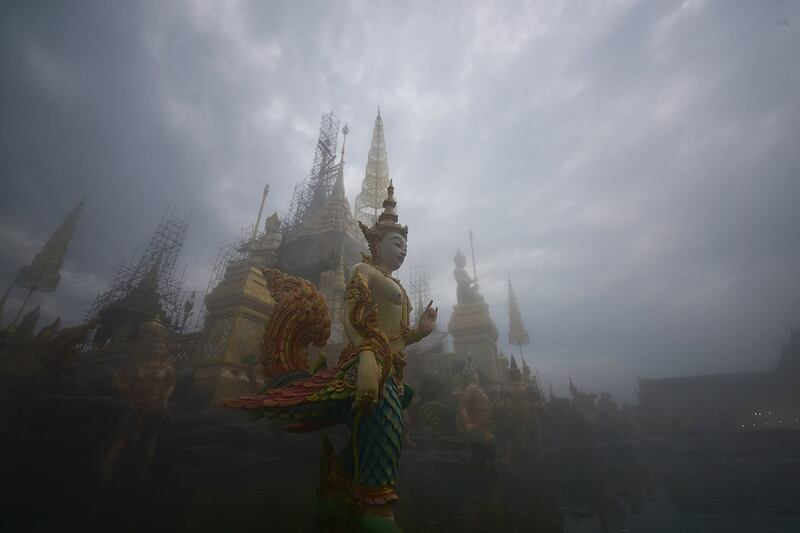 Lately, the political events that divided the Thai people happened while the king was unwell. He just did not have the strength to come out. So, some old cronies took advantage of the situation and divided the country. If our benevolent king was in good health, I am sure that he would have succeded yet again in preventing the division. But, in death, he had again unite his people, but for the last time. Even the Prime Minister, Prayut Chan-o-cha, who is known for his many words, had to tape his speech as he kept crying in between takes. His love for the late king and to the monarchy is welknown and understood. 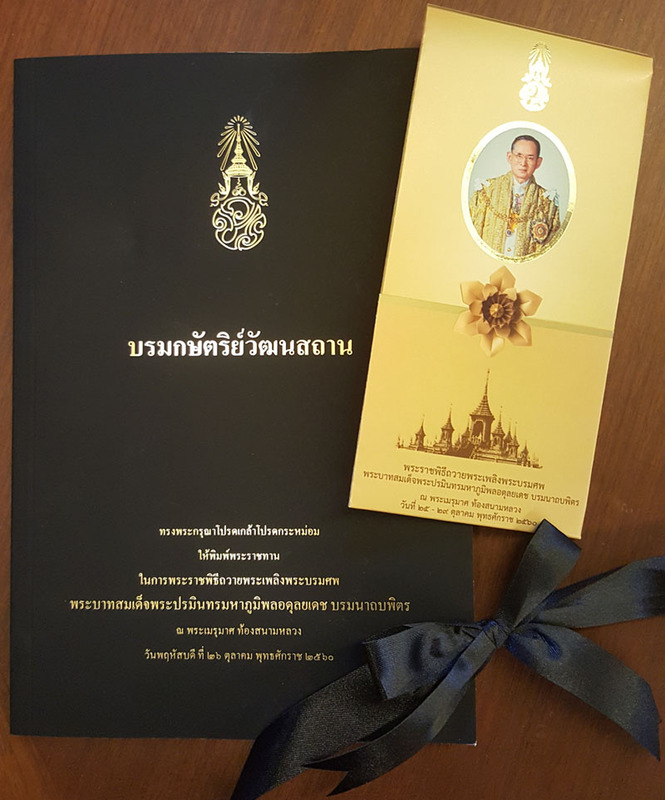 While I attempted to make this page a tribute page, it is turning out to be a collection of news and events relating to the funeral of the late king. I have never planned for this type of page, and will let it go on its own course. A tribute or not, or a news update or some kind of information page, I am doing this to record it, as King Bhumibol Adulyadej was a king Thailand would and should not forget, for his whole life was completely given to his country and people, something that no-one can ever do. Those who say negative things should look at themselves first, if whether they could have done the same for the people of Thailand as Bhumibol The Great has done. The last time the Thai people were truly united was in 2006 when His Majesty the King celebrated his Diamond Jubilee, or 50th year on the throne. Many people can still remember the sea of yellow-shirted people filled up Rajdamneon Avenue in front of the Ananta Samakom Throne Hall. When the king came on to the balcany, everyone chanted in unison "Long Live His Majesty The King". Even thinking about it makes the tears swelled up in my eyes still. Why? Because he has given up his entire life to his people. His good intentions for the country knew no bounds - no single person can match that. And, the strength of unity is simply unmeasurable. 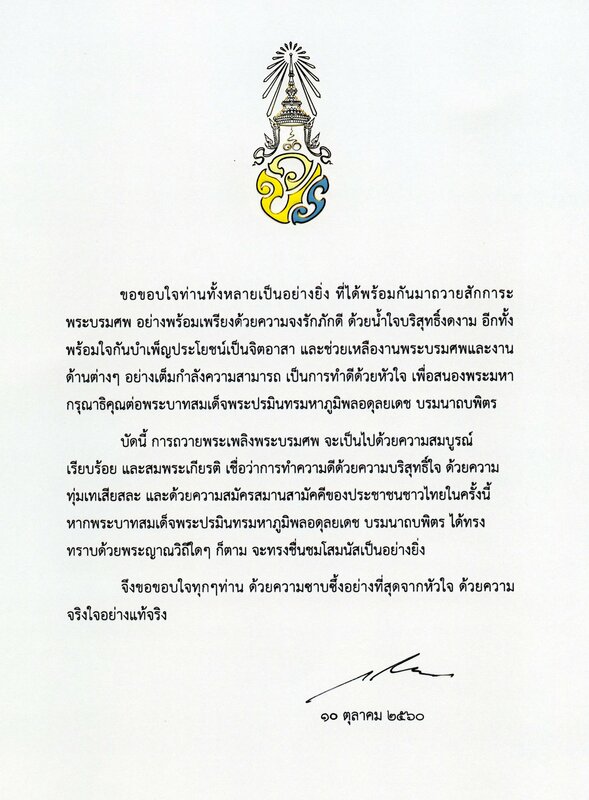 I can say for certain that although the love exists between the people and their monarchs in other countries, that love and respect is not the same as in Thailand. It could be because of circumstances - that Thailand is politically unstable since the change to constitutional monarchy in 1932 - that the monarchy has in fact been the only stable entity in the entire country and its history. 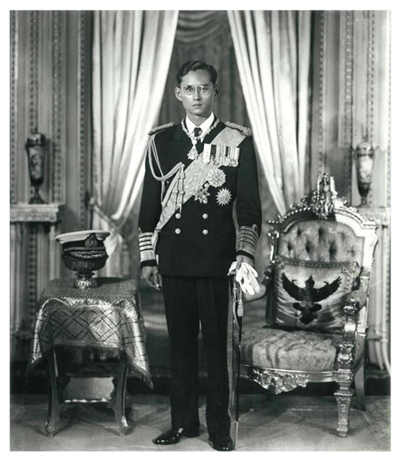 The then government was known to be jealous of the love and respect shown by the people to King Ananda Mahidol (Rama VIII) even though he was young, has not rule as yet, and was the first constitutional monarch. His death had put Siam into mourning, and in effect united its people. And now, 70 years later, his brother, King Bhumibol Adulyadej again has united his people in death. 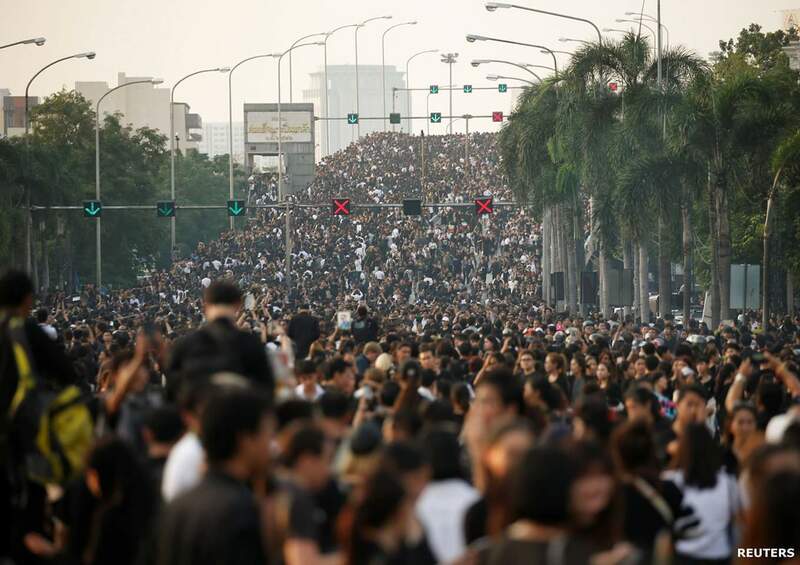 On the afternoon of 14 October, the sea of black can be seen endlessly from the Grand Palace to Siriraj Hospital. The people came out to pay respect to their King, while his body travelled back to the Grand Palace for the lying in state. There is really no need for any explanation anymore, as the action pretty much speaks for itself. The video link at left shows the late king's body en route from Siriraj Hospital to the Dusit Maha Prasat Throne Hall in the Grand Palace. HRH Crown Prince Maha Vajiralongkorn arrived at the hospital sometime after 4pm on Friday 14 October 2016, together with members of the Royal Family, and accompanied the late king's body. Sometime after, Her Majesty Queen Sirikit also left the hospital to go to Chitralada Villa, Dusit Palace. She had suffered strokes several times in the last year or so, and her showing in public has made her subjects very happy indeed. The funeral rites begin with the bathing rites which is for members of the Royal Family only, and some members of the Royal Houses with the ranking of Royal Highness (Pra Ong Chao) up. 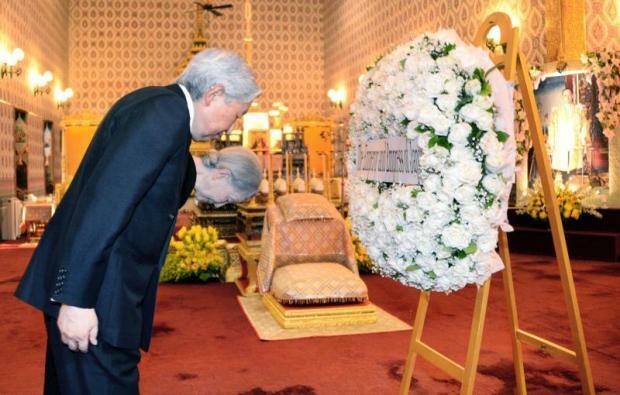 Similar procedures can be viewed at the late Princess Galyani Vadhana's State Funeral page. The ancient funeral rites is then performed afterwards. The video at left shows the ceremony within the Dusit Maha Prasat Throne Hall. The Buddhist monks chanted age old Royal verses. 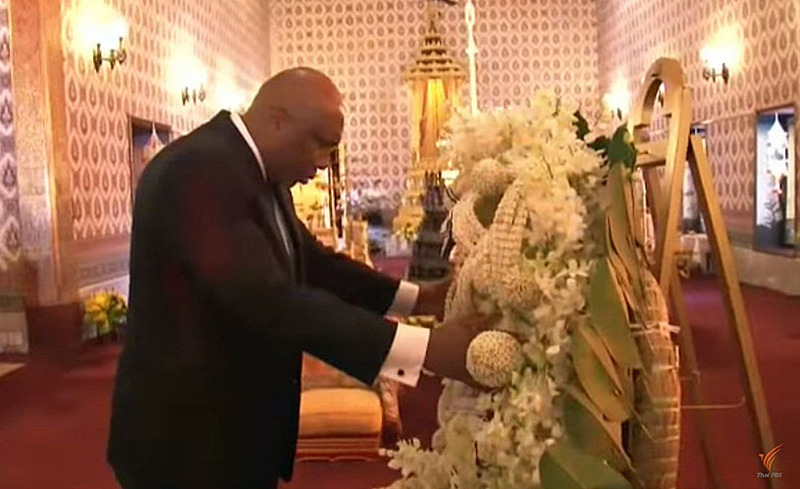 The Royal Funeral Urn where the late king lays in state is placed on the South side, per tradition. 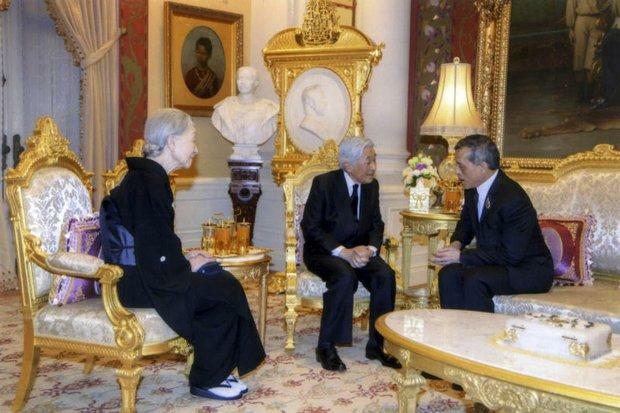 The opposite side is the covered seats of the late King and Queen Sirikit, while the Crown Prince sat next to them. The officials of the Royal Bureaus are also placed here. Behind the Crown Prince, on the Eastern wing is the Royal Family, and beyond the members of the Royal Houses. On the Western wing is where the government is placed, in front of the chanting monks. The Royal Funeral Urn used here is of the highest rank, used for kings, queens and senior members of the Royal Family. 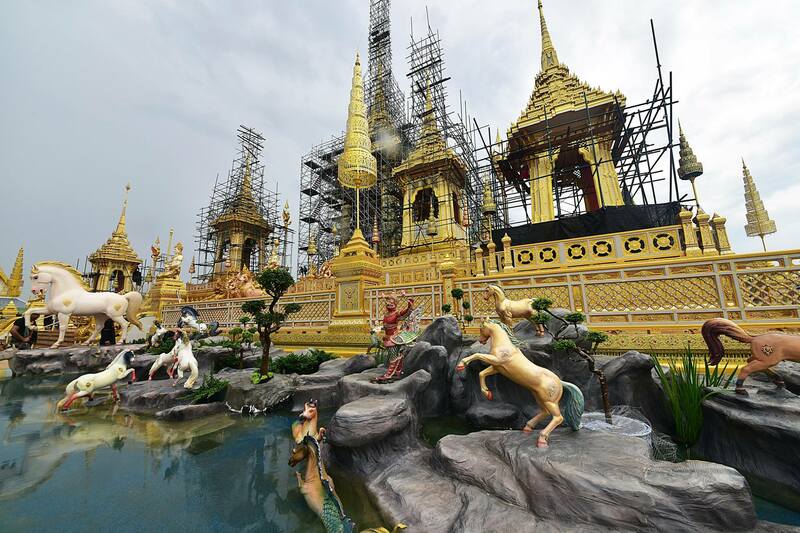 This one is actually built new by the late king for the funeral of his sister, HRH Princess Galyani Vadhana, in 2008, based on the old one. 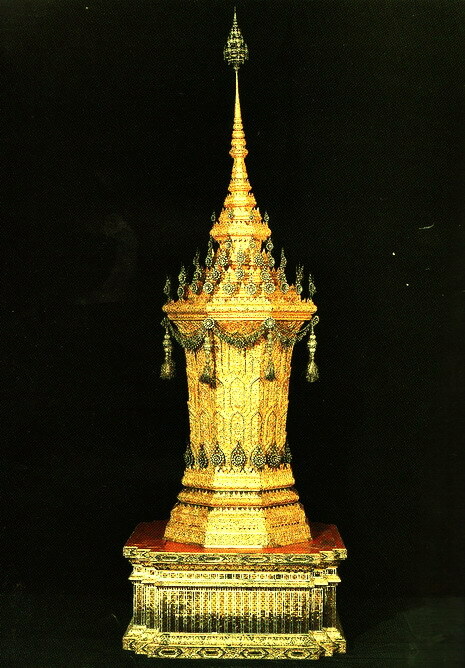 The first urn was built by King Rama I in preparation for his own funeral, but was first used for a senior daughter who died before the king. That urn was used up to the Nineth Reign, the last person being HRH Princess Sri Nagarindra, the Princess Mother in 1995. After that it was retired as it was getting too old, and needed much repair. It is now placed in the National Museum. A new one was built using the same designs as the old. The top the Royal Urn is decorated with diamonds on gold, with the base of the top part decorated with moving gold flowers set with diamonds. The urn itself is an octagonal shape made of intricately carved wood covered in gold and decorated with glass. What you see here is the outer cover. The inner cover is made new for every funeral, which would normally contain the royal body. Nowadays, many prefer the use of coffins, which are placed behind the urn. But Princess Bejaratana, who died in 2012, elected to be placed in the urn, and not the coffin. In this case, the body would be place in a seated position per the ancient customs, rather than lie flat in the coffin per Western customs. She was thus the first to actually used this urn, as she was actually placed within it. 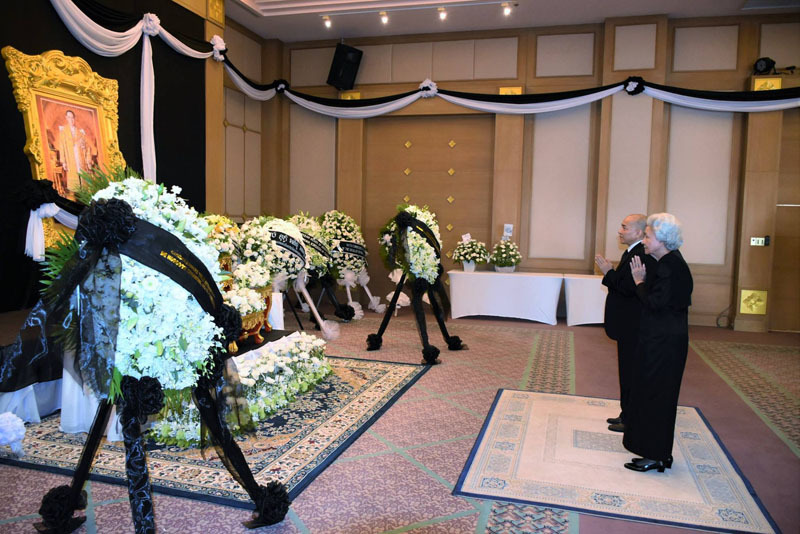 Princess Galayani and the late King Bhumibol have both chose to lie in coffins. His Majesty King Bhumibol Adulyadej is accepted world wide, as a working monarch who gave all to his people. On his Diamond Jubilee celebrations, when most of the crowned heads of the world came together in Bangkok to congratulate him, the Sultan of Brunei, as representative of the foreign royals, gave a beautiful speech to His Majesty, acknowledging his life work. 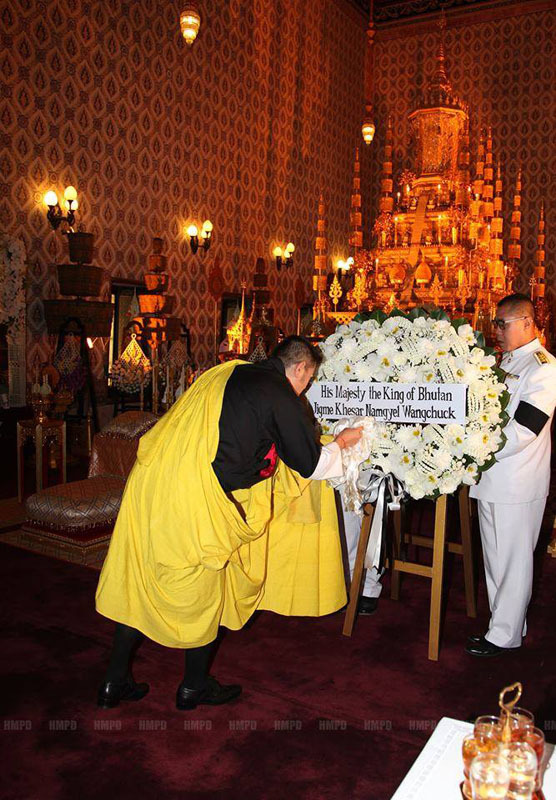 A few days ago, the King of Bhutan made special prayers for King Bhumibol, and travels to Thailand on 15 October to personally attend the religious ceremony at the Grand Palace. 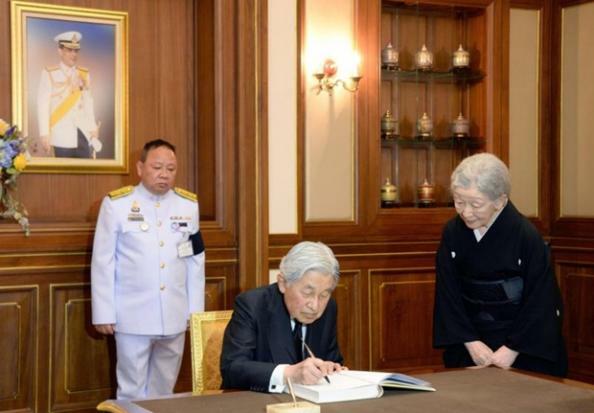 The Emperor of Japan has also declared three days of mourning. Queen Elizabeth II of Great Britain, now the longest reigning monarch in the world, sent personal messages to Her Majesty the Queen. Numerous other royal families sent their condolences. The UN General Assembly acknowledged a minute silence in honour of His Majesty on the day of his death. This is another very kind remarks about King Bhumibol by Ambassador Samantha Power, author and diplomat who currently is the United States Ambassador to the United Nations. She sums up very well the what life for our late king was all about, and it clearly shows why he is so much loved by the Thai people. TM the King and Queen of Bhutan visited Thailand, 16 October 2016. 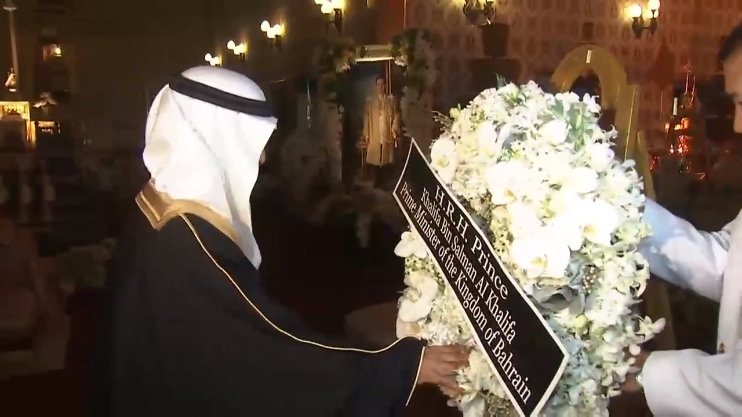 HH Prince Khalifa bin Salman Al Khalifa, Prime Minister of Bahrain, paid tribute at the Grand Palace, 18 October 2016. 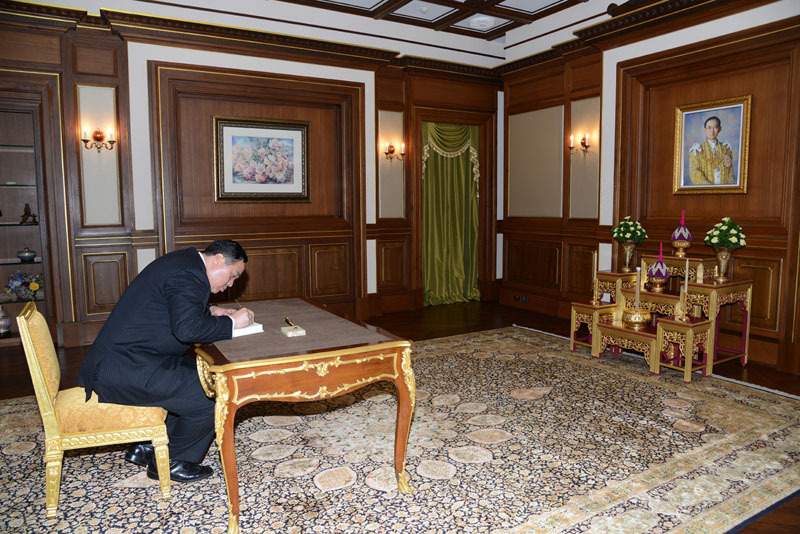 TM The King of Cambodia and The Queen Mother of Cambodia signed the condolence book at the Royal Thai Embassy, Phnom Penh, 18 October 2016. 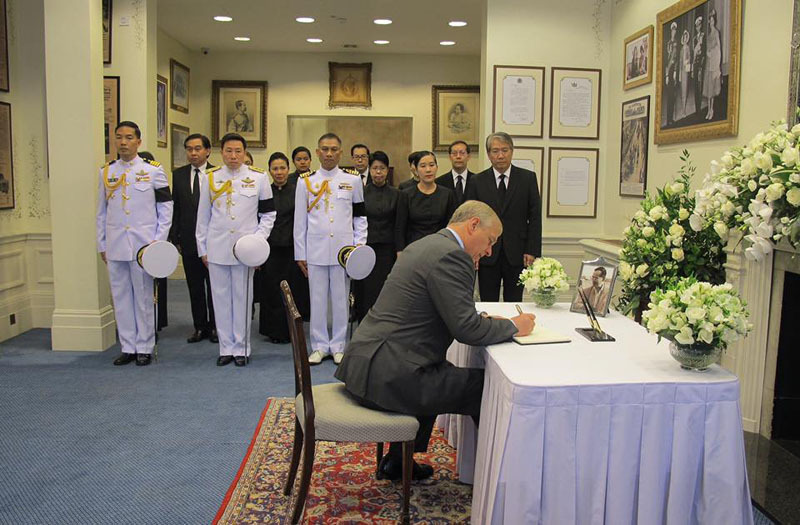 HRH The Duke of York signed a condolence book at the Royal Thai Embassy, London, 18 October 2016. HM The King of Lesotho paid his respect at the Grand Palace, 2 November 2016. HRH The Crown Prince of Tonga signed a book of condolence at the Grand Palace, 15 November 2016. 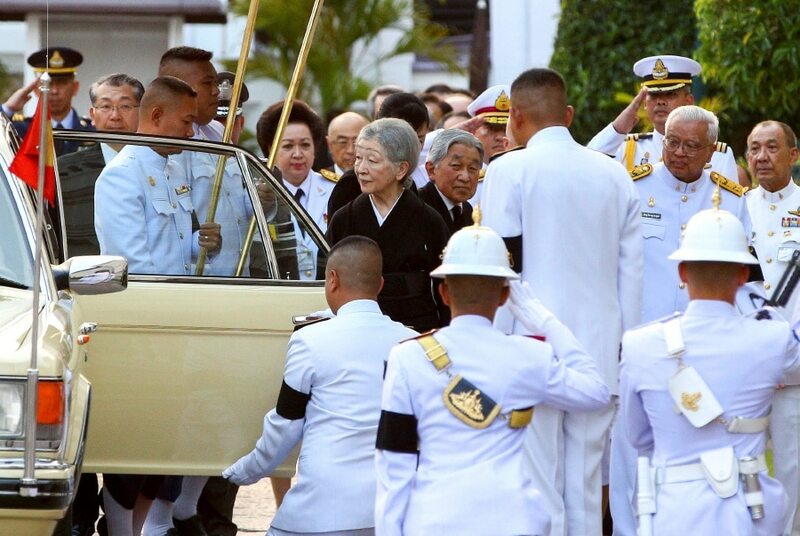 TIM The Emperor and Empress of Japan paid their respect at The Grand Palace and had an audience with HM King Maha Vajiralongkorn at Amporn Villa, Dusit Palace, 5 March 2017. Watching the news, and seeing King Maha Vajiralongkorn receiving the Japanese Imperial Couple shows the special friendship that we have between our two royal families, and noticing our king's body language in receiving the two much respected and love royals in their own country reminds me of the special and unique culture of Asia. When the king bows to the imperial couple, even though he is now of the same rank, it shows the respect that we Asians have for those who are older, a touch of specialness that is truly unique to Asia. Postcards of the late king with timetable of events. 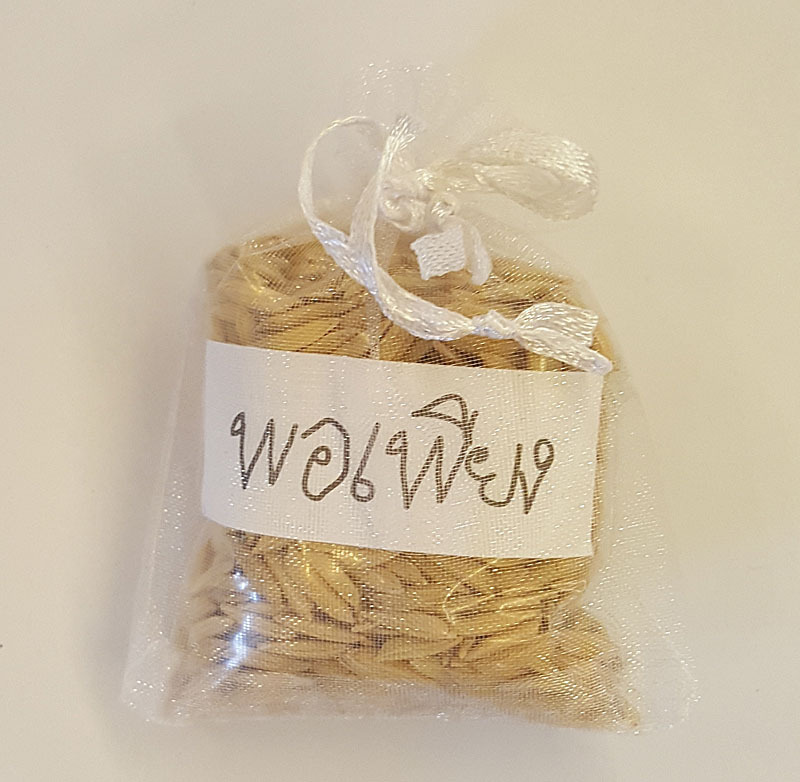 A pouch of rice with the word "enough", reflecting the king's teaching of knowing when one has enough to live on, and not wanting more than necessary. Booklet containing the king's wise words. It was first announced that the last day for people to pay respect to the late king was to be 30 September 2017, but more and more people came from all over Thailand. 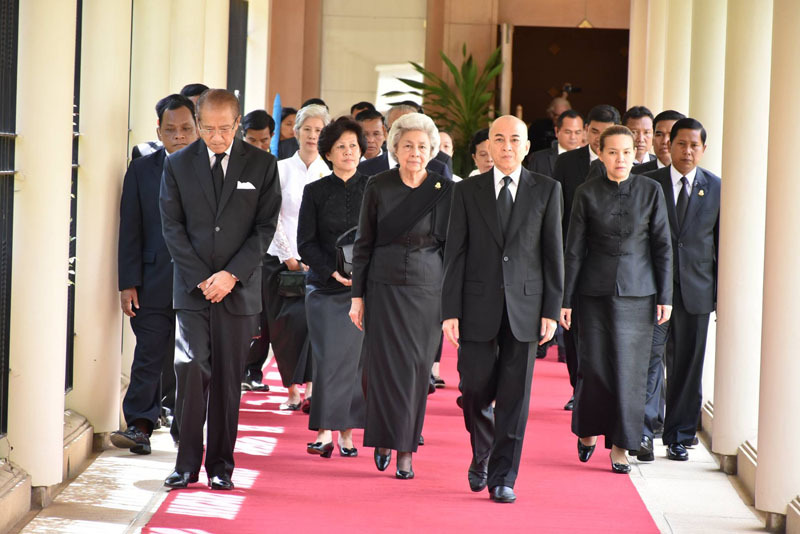 There were just so many people, HM King Maha Vajiralongkorn granted an extension to 5 October. 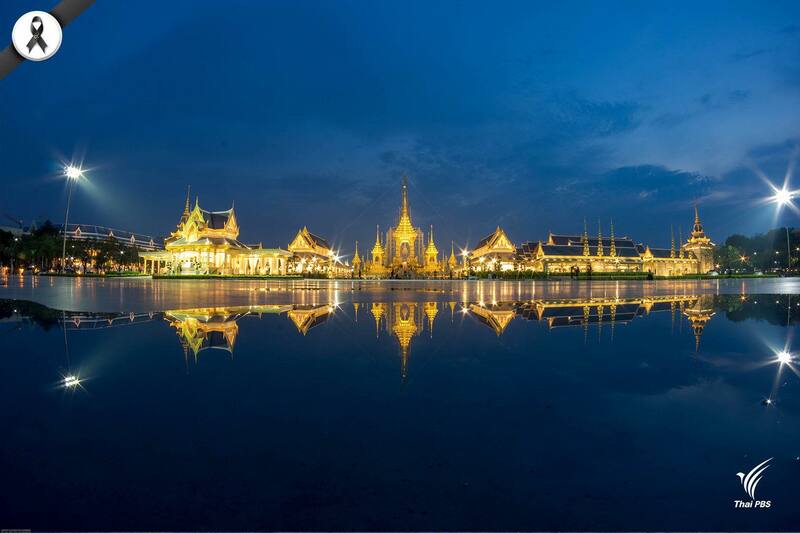 The palace door closed at 12.20am on the morning of 6 October, and the last of the general public left the palace at 2.18am, reported by the Thairath Newspaper. 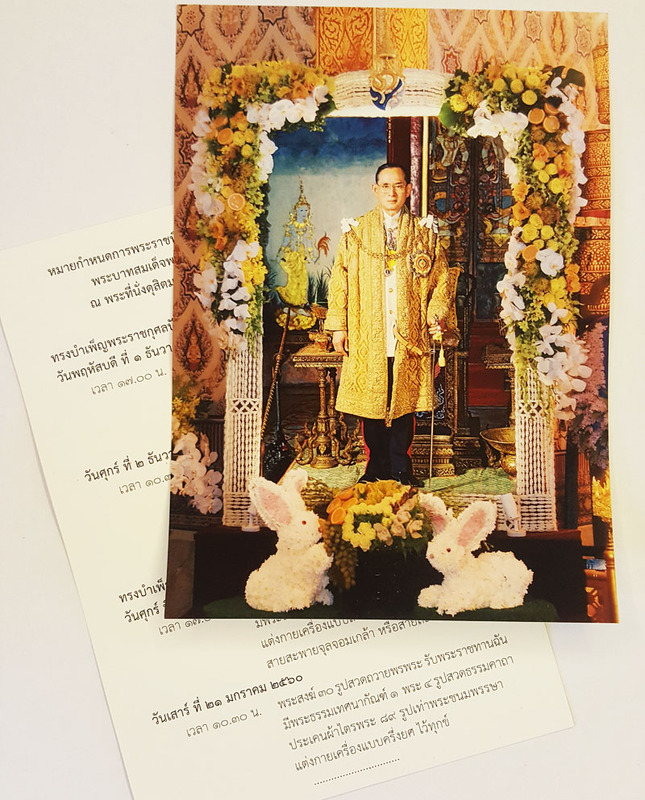 On 10 October 2017, King Maha Vajiralongkorn issued a letter thanking the public for their involvement in the Royal Funeral Ceremony, from attending the ceremonies to helping out in every way. The general public has patiently queued up to go to pay their last respect to the late king, some took as long as 8 hours. Many stood in the heat, and rain. Others helped out by distributing food and drinks to those who waited, especially the ones who travelled great distances to bid farewell. Many lit candles or sat and prayed by the palace walls. On official count, there were altogether 12,739,531 persons who came to pay their respect to the late King Bhumibol Adulyadej over 337 days. It has been exactly one year to this date, that HM King Bhumibol Adulyadej, Thailand's, as well as the World's longest reigning monarch to the date, passed away. Most Thai people were born in his reign, thus they "knew" only him - The King who has looked after his people through both good and bad times, and always stood by the people's side, particulalrly when there were spats between political parties, which were often. His passing away has left a big void in the people's heart, and understandably, many felt lost. As the king was the country's major pillar, it felt like the strong pillar that held up the kingdom's roof has fallen, which left open the opportunity for changes, either good or bad. But, with the army in power having taken over the country, their loyalty to the crown made it their first priority to keep peace. 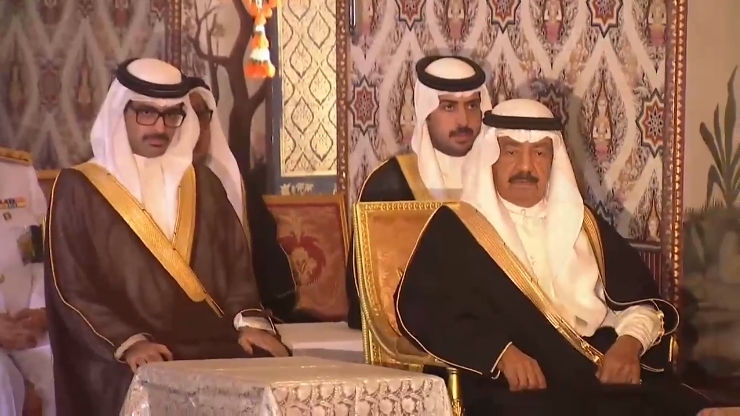 The transition in the period of one year has made the kingdom a place of stability, even though it was seen by the outside world as undemocratic. Personally, I think democracy has different meanings to different countries and cultures. What keeps peace and stability is the first thing that really matters, no matter what one calls that particular way of governing. A great set of video documentaries totalling 8 episodes explaining the Royal Funerals of Siam which ran back centuries, as well as giving information of the upcoming ceremony of His Majesty the late King Bhumibol Adulyadej. 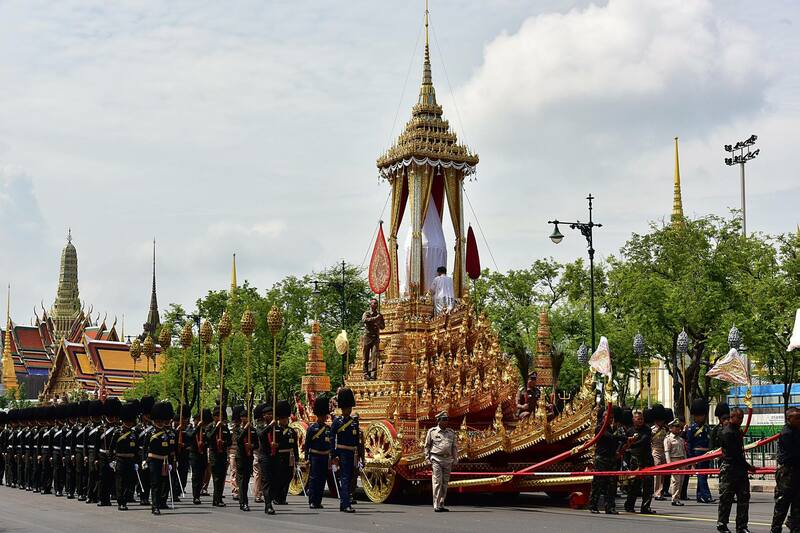 At right is Episode 7, The Royal Cremation Ceremony Accorded to A Thai King. Please follow the links below for Episodes 1 through 8. The last evening ceremony before the Royal Cremation Ceremony. 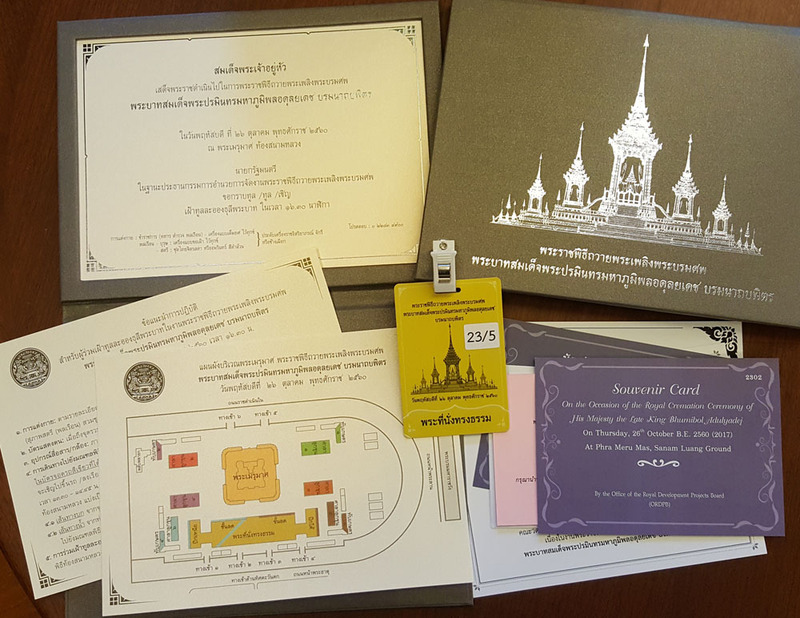 Invitation Pack consists of the invitation card, seating map, seating tag, note on how to dress and behave, and souvenir cards for commemorative books to be collected later. 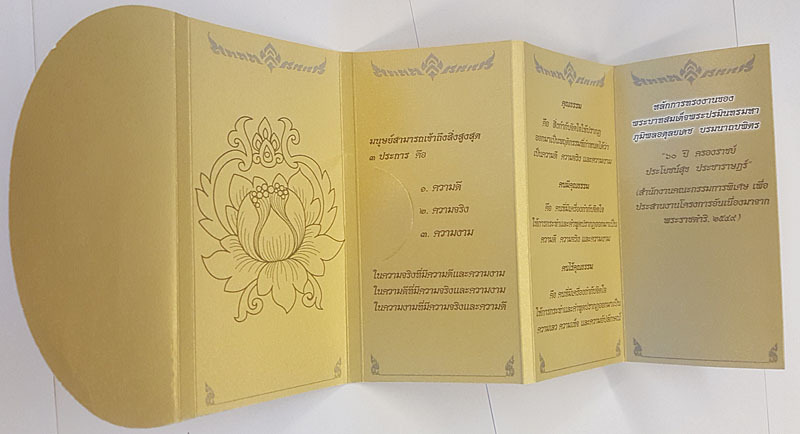 Commemorative book given on the cremation day, and a brochure giving information about the Royal Cremation Ground. Cremation of His Majesty King Bhumibol Adulyadej.